Research | Abhishek Kathuria, Ph.D.
My primary research interests lie at the intersection of Information Systems and Strategic Management. Aspiring to be an Information Technology (IT) Strategist, I seek the organization as the principal level of analysis in my research. I address questions about the strategic implications of information systems and about IT and emergent organizational capabilities, particularly those associated with knowledge and innovation. Within this broad domain, I am currently working on a number of projects that fit into two major threads: the the intangible value of IT, and, technology acquisitions. I have additional interests in the study of enterprise systems and emerging patterns of commerce and business models in hyper-competitive and hyper-turbulent immersive and digital environments such as virtual worlds and social games. I strive to examine phenomena that are prevalent in hitherto less examined research settings, such as fast growing developing economies, knowledge-based organizations and virtual environments, but have implications for larger audiences. For this purpose, I employ a mix of methodologies, that include computational simulation approaches (particularly Agent Based Models), structural equation modelling and varied econometric methods. I espouse a positivist philosophy whereby the epistemological premise of my research is the existence of a priori fixed relationships within the phenomena under study. The notions of Occam’s razor, cumulative science, falsification and deduction form the basis for this philosophical approach to scientific inquiry Thus the relationships I examine are capable of being identified and tested through deductive logic. The ontological basis of my research is an objective physical and social world that exists independently of humans. Or in other words, my research philosophy is nomothetic logical positivist empiricism. My Ph.D. research, conducted under the guidance of Dr. Benn Konsynski and Dr. Michael Prietula, examined the role of information systems in managing strategic tensions that arise from an organization’s concurrent pursuit of seemingly contradictory strategies. Using empirical studies and agent based models in this research, I found support for my assertion that IT is a facilitator of internal and external organizational ambidexterity and multiple organizational identities. I have several ongoing projects on varied topics with my advisers, fellow SoBs (Students of Benn), Trindians, and HKU colleagues. 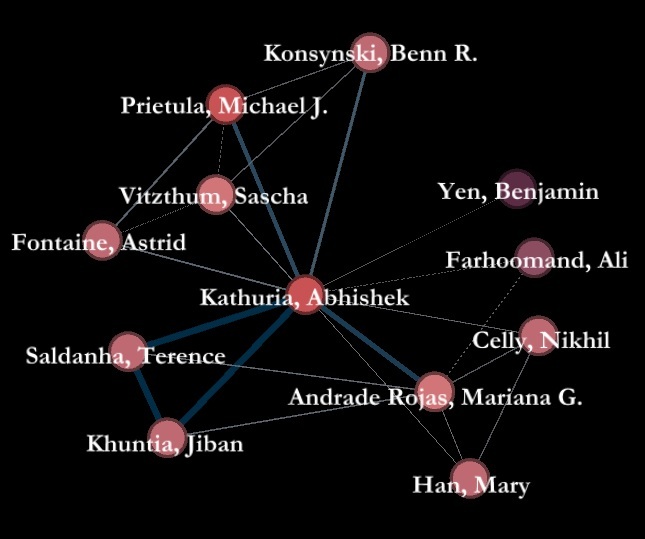 A visual representation of my co-author network (first-degree connections only) is below.